This post is about the time we spent in Spain over Christmas and the New Year. Our friend, Jared, met us over there for the entire trip and our flatmates, Holly and Matt, met us in Madrid for the last couple of nights. Rather than using public transport to get around, we hired a car to travel around the country. We started in Barcelona; drove to Valencia (via Monsterrat) and had a day trip to Morella; drove further south to Seville and had a day trip to Màlaga, and ended the trip by spending the last few nights in Madrid. Boy and I arrived in Barcelona 36 hours later than we originally intended to due to a drone that was sighted over Gatwick Airport. This meant we arrived at midnight on Saturday, and had about six hours in Barcelona on Sunday before needing to hit the road to get to Valencia. 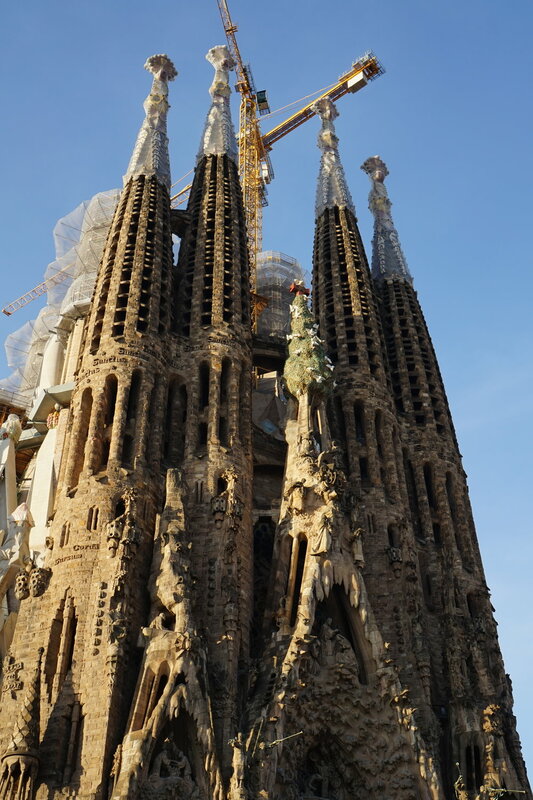 With our limited time, we visited the Sagrada Familia – we didn’t go inside, but the exterior provides more than enough to see. The cathedral has been under construction since 1882 (expected to end in 2026) and it truly does provide a sight to see. There are so many different things going on; different spires; different carvings; different eaves, doors, materials – everything! We were there at 9.00am so it wasn’t too busy. After seeing the cathedral we picked up the car, packed our bags and headed to the beach for a walk along the promenade before driving to Montserrat. Montserrat is a mountain range about an hour north-west of Barcelona. The name means ‘serrated mountain’ and at the top of a mountainous drive is the Santa Maria de Montserrat abbey of the Order of Saint Benedict, which you are free to visit and look around. If you want, you’re able to join a queue to see a model of the Virgin of Montserrat inside the church, or you are able to just sit inside and appreciate the beauty of the building. After our six hours in Barcelona and Montserrat, we drove five hours south to Valencia. Valencia is so cool – it has a beautiful city centre and orange tree groves everywhere. We arrived on the evening of the 23rd, so our first full day in Valencia was Christmas Eve. We spent the morning looking around the town centre sightseeing, enjoying paella for lunch, and doing a spot of grocery shopping to buy everything for our Christmas Day dinner. Most shops were closed Christmas Eve, so that evening we found the one restaurant that was open to have dinner and went back to the AirBnB. the rounded building in the background is the catedral de sevilla - a unesco world heritage site. you can see the laundry lines hanging above the cathedral square! This was a day trip we did on Boxing Day. Morella has been named as one of Spain’s most picturesque town and I can see why – it’s stunning. I already love mountain towns, but this was next level. Unfortunately, because it was Boxing Day (or the day after Christmas Day which mightn’t be called Boxing Day in Spain), everything was closed. This meant we couldn’t go into the castle but we could still explore the beautiful buildings and appreciate the lovely town centre built into the hillside. After our time in Valencia, we drove even further south to Seville – the heart of bull-fighting and flamenco dancing. Seville was my favourite town after Morella because it has the beautiful River Guadalquivir running through it and there are carts being pulled by horses everywhere. It’s a tourist attraction – Spanish people don’t use horses to get around – but was still neat to see! 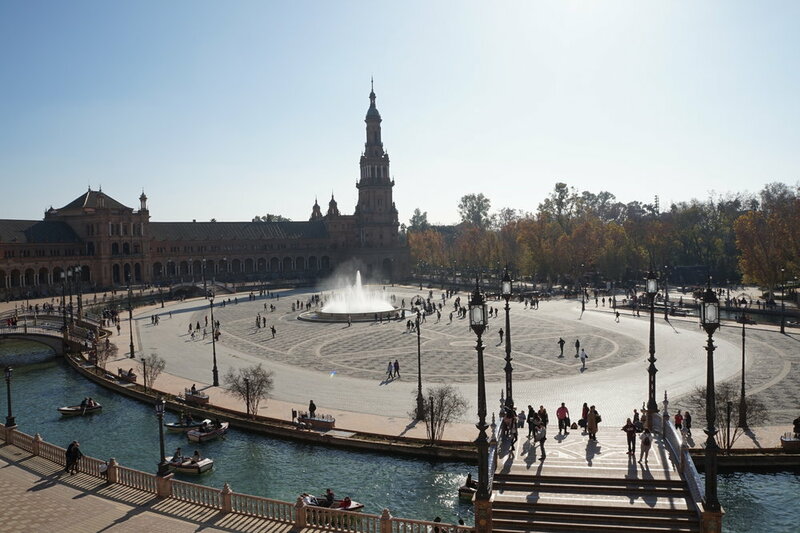 My favourite attraction of Seville was the Plaza de España: a large historic marketplace that has lots of stalls decorated with different mosaic artworks, and a huge water fountain in the middle of it. That evening we watched a flamenco dance show which was great: every so often the group would stop at the end of a number, motion to the audience and we would say ‘Olé!’ So Spanish! Our second day in Seville was spent taking a day trip to Màlaga. I didn’t know anything about Màlaga before going there other than it’s where lots of British take their summer break. It turns out that Màlaga is the birthplace of Pablo Picasso, so we went to the Pablo Picasso Museum to look at artworks he had created during his life. I found it fascinating to see how his work evolved over his career with more “typical” styles of art to his well known cubism style later in his career (I’m no art expert so even that description was a stretch for me!). Màlaga was also a lovely city that had a beautiful town centre and - again - orange groves throughout. After Seville, we drove four hours north to the centre of Spain to spend our final two nights in Madrid which is where our flatmates, Matt and Holly, joined us for New Year’s. Our one full day in the capital was spent visiting the popular food market Mercado de San Miguel and the Royal Palace of Madrid. That evening was New Year’s Eve and, in true Spanish tradition, we all ate 12 grapes at the stroke of midnight! So there you have - our ten days in Spain. I had a wonderful time and only travelled through the southern half of the country; I’m excited to see the northern half in the future. I’ve created a small travel vlog of our time there. Enjoy! My next post is going to be about my recent trip to Ireland (Dublin, Cork and Galway).